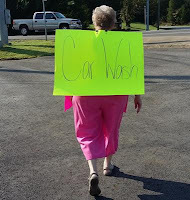 We had a great time at the car wash on Saturday! Our team raised $400.02 for the mission trip to Alaska. This is divided among the participants who will get credit for helping. We couldn't have done it without the support of Bookout Tire in Etowah, our bakers and all of the people who stopped by! Thank you all!! Participating in the Highway 411 yard sale will be our next fundraising effort. We'll have bottled water and munchies available to perk up tired yard sale shoppers. Plus, lots and lots of great yard sale items! You'll want to put this one on your calendar folks. The exact location is TBD, but I'll be posting here as soon as it is set. Now for those great car wash tips and photos!